Opened on January 23, 1861 by John D. Carroll, this was one of the finest public houses in Victoria. He served beer in brown bottles with a label that said “Brown Jug.” In 1912, the owner took over the adjacent Albion Hotel (built 1880) to comply with the new liquor act and named the complex the Brown Jug Hotel. In 1917, the Brown Jug Saloon was closed, a victim of prohibition.For 56 years, it had been B.C.’s most exclusive pub. About 1918, Mr. F. J. Williams turned the building into a drug store. The building has suffered many renovations over the ensuing years and there remains little of its proud history. 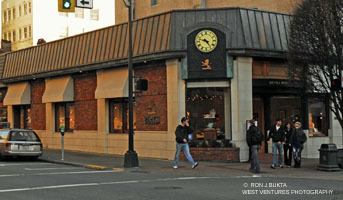 It is now the home of Birk’s Jewellers.